Update: KPUA radio station in Hawaii has dropped Rush Limbaugh's radio show. One down, 599 to go. We are strong believers in the first amendment and have recognized Mr. Limbaugh's right to express opinions that often times differ from our own, but it has never been our goal to allow our station to be used for personal attacks and intolerance. The most recent incident has crossed a line of decency and a standard that we expect of programming on KPUA whether it is locally produced or a syndicated program like the Rush Limbaugh show. At ProFlowers, our mission is to delight our customers with fresh and long lasting flowers, and that is our singular focus each and every day. We do not base our advertising decisions to align with any particular political view or opinion as our employees and customers are as diverse as the USA. Mr. Limbaugh’s recent comments went beyond political discourse to a personal attack and do not reflect our values as a company. As such, ProFlowers has suspended advertising on The Rush Limbaugh radio program. As BTD noted, Rush Limbaugh has now apologized to Sandra Fluke. Contrast the tone and brevity of his apology with his screed yesterday mocking objections to his attack on Ms. Fluke and with his original verbal assault on her. Either he's completely obtuse or he got arm-twisted. Either way, his apology is unlikely to satisfy anyone. We don't condone negative comments directed toward any group. In response, we are currently pulling our ads from Rush with Rush Limbaugh. Recent comments by Rush Limbaugh do not align w/our values, so we made decision to immediately suspend all advertising on that program. Due to continued inflammatory comments– along w/valuable feedback from clients & team members– QL has suspended ads on Rush Limbaugh program. Media Matters has the transcript of Rush Limbaugh telling his audience that in the past, he told the reporter of a national newsmagazine he would dig into his past to come up with dirt on him in order to get the reporter to change his story. Rush felt the reporter's story was a hit job so he says he engaged in the "destructive" behavior himself. He says the statements did the trick and the reporter changed the story. I've practiced it once. I am not going to tell you the story because I'm don't want to give it away, and I would have to mention names, and I'm not going to mention names. But there was a cover story on me coming out of one of the big news magazines, and it was going to totally mischaracterize me and what I do and how I do it. And we found out who was writing it and made a couple phone calls to the person writing it. And we said, "You know what? We're going to find out where your kids go to school. We're going to find out who you knocked up in high school. We're going to find out what drugs you used. We're going to find out where you go to drink and do -- we're gonna find out how you paid for your house. We're going to do -- and we're going to do exact -- and we're going to say that, you know what? Rush Limbaugh is in his final month of probation. When the month is up, the charge of doctor shopping will be dismissed without his ever having had to enter a plea. He will have a clean record. According to records, he'll have made an estimated $50 million while on conditional liberty. "All's well that ends well," he said, contemplating the Oct. 31 finish of his 18-month probation, barring unforeseen trouble. 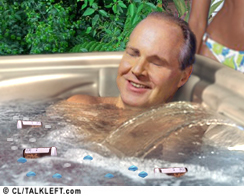 "The system is what it is," Limbaugh, 56, said from his oceanfront compound in Palm Beach. "I became addicted to drugs because of a medical condition" - a bad back - "and I'm convinced now that most addicts come to a point where they do drugs just to stave off withdrawal. The details of Rush's plea bargain are here. According to court documents, investigators alleged Rush obtained 2,000 pills over a five month period. What a great job his lawyer, Roy Black, did for him. I'm sure it cost him a pretty penny but I hope he appreciates it.